There is a soft glow of yellow rays streaking through the curtains of my room and land on the table and floor like a faint gold dust. During weekends, I am able to face the early rays because my table is facing the windows towards sun rise. And on it are my laptop, magazines, books and other stationary. Whenever I write early in the morning, the view from my room gives me some positive vibes as I am facing the sun which I used to say welcoming me to another new day. What adds beauty to it are the sounds of chirping birds singing their songs among the trees near-by. And there are hills that look majestic with palm trees interspersed among other trees. I hope that fresh, beautiful view will stay for a long time as they are on private ground. Another Sunday..I thought of pampering myself by waking up late but my eyes seem to have been programmed to be up early! I witnessed a lot since then. In the stillness of dawn, trees seemed standing still before welcoming the early breeze, flowers dotted with dew and looked so fresh and fragrant, the stars still twinkling before the sun appeared. The birds must be still dreaming before singing their first song of the day. It is typical of me to go out to the balcony, take a deep breath of fresh air and never miss a moment to look up at the sky and watch those tiny diamonds and the moon's face. Then, I look far away at the horizon, always thinking of what goes on at the other side of the world. My mind flies to my sister and friends. If only the world is flat, then we'll have the same day and night. And she called again last night. She said she had just taken in the clothes from the drying line, while at the same time I was about to hit the sack. She is enjoying summer which will end soon, while I am having rain and shine throughout the year. Much to talk about, that's my sister who always calls from a far away land and each call lasts for about half an hour. That is when we catch up on what goes on her side and what is on mine. Yes, it is Sunday, a day to take a walk in the park which I did not do for quite some time or perhaps enjoy the morning walk at the promenade. One place that will be crowded today is the old airport because there is big bikes show going on. Yesterday, I saw a group of guys and girls, each riding Harley Davidson. They looked so cool! September is a month of festivals here which takes place one after another. 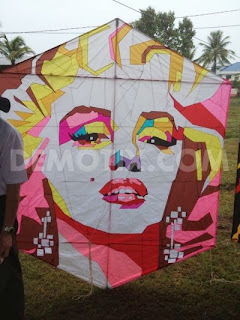 The 9th Borneo International Kite Festival was held last week. There were many unique art pieces flying in the sky of Bintulu. I did not know Marilyn Monroe was here! Thanks to Paavan Solanki for uploading this image at demotix.com. This is among the beautiful kites that wowed kites enthusiasts - local and international. And this evening, there will be the Tanglung (Lantern) procession in conjunction with Lantern Festival. The esplanade is now decorated with so many types of beautiful lanterns of all sizes and shapes. Just can't wait to see the lighted lanterns! There are quite a lot of things I would like to do today. One thing for sure, I will blog walk and enjoy interesting posts of friends. Apart from that, I am invited to three wedding receptions which I should not miss. Thank you BB, for giving us a so colourful, and vivid experience of a Sunday day. It is so real that feeling of far away friends and kin living on different lands, taking other ways of enjoying the beautiful gift of life. Everyone of us partakes the sense of belonging with our relatives and friends all over the planet, it is a magnificent sense of being part of a unique soul. You are describing so well the marvel of Nature, which is similar in all parts of the world, only the lore and cultural whims make the differences humankind has. The lovely festivals in your city are provoking longing desires of being there and take pleasure in sharing the common moments. Thank you again BB, for this magical present! It's my pleasure, Od. Much thanks to you too for taking your time reading this entry and much more for your kind words which are always so uplifting. Kins and friends will always be so close in our hearts wherever they are. Only time and distance separate us. My love for nature will never die. I know each day a part of nature disappears. There are so many other festivals going on in other parts of my country. As you know, my country is multi-racials, multi-religious and multi-culturals. I had the privilege of watching those beautiful kites which were presented by local participants and those coming from other countries such as Korea, China, Australia, Japan, Thailand, to mention a few. Altogether 32 countries took part. It was a very colourful event. Beautiful words to start a day...I just hope all my mornings are like this. Full of hope, full o f joy, full of life!! Ho Balqis this is beautiful! the morning sun rays hit your desk while the sunset light hits my desk, we can say as the sunrises on you it sets on me here on the other side of the world. I am sure your sis smiled when reading this and I know its not easy to be so distant.. and distance is not the only thing, like you cleverly pinpointed " if only the world was flat" you could be watching the same sun or perhaps the same star. A kite festival that must be fantastic to witness!, and a lantern festival its like being in a fairytale!. Hotei, no matter where we are, we do get the same sun, that's the beauty of it. Yup, sunrise here, sunset there. My sister is always updated on what's going on here. We're in constant touch though living so far, far away from each other. She's in England. The Borneo International Kite Festival is an annual event here. It attracts people from far and near. You're right about the lantern festival.